On the stovetop, heat 2-3 tablespoons of oil in a cast-iron skillet over medium-high heat. Cook hash browns in oil until golden brown, about 8-10 minutes. Sprinkle with cheese and crack 3 eggs on top of hash browns. Transfer skillet to oven and cook for 6-9 minutes, or until the whites of the eggs are set. Every Sunday, my boyfriend and I sneak out long before most people are awake to steal ourselves a seat at our favorite local diner. Breakfast is always the same—a cup of coffee, a plate of hashbrowns and eggs. It’s basic, I know. But it’s splendid and simple. One weekend, the alarm failed. We woke, blinking, to bright midmorning sun. Our early morning ritual dashed, we decided to recreate our usual at home. Turns out, it’s even better that way! There’s nothing like sitting with the fire blazing in pajamas and socks, with a hot coffee on the coffee table and this pretty little 3-Ingredient Egg Breakfast Skillet on your plate. Whether you’ve overslept your own weekend morning ritual or are simply looking for a way to wow your humans, this divine dish should make it on your menu. You will not be sorrowed. Here’s your ingredient lineup: hashbrowns, eggs, cheese. That is literally it. It’s like a minimalist dream come true. 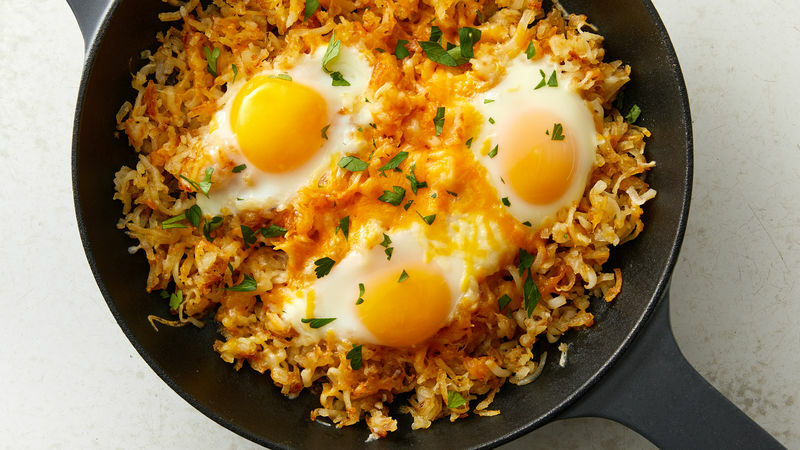 Pop your hashbrowns in a cast iron skillet and cook until golden brown. Now, here’s a little trick I’ve learned about hashbrowning: Leave them alone and resist the temptation to overstir. Those beautiful little hashies won’t brown if you’re constantly meddling, so let them fry for at least 5 minutes before you flip them or fiddle with a spatula. Now, grab a spoon and create little nests in your hashbrowns. Just a slight tamping down is all you need, you don’t want those hashbrowns to give way to the bottom of the skillet. Just create a little space for your eggs to settle. Which is, hands down, the most delicious little brekkie you’ve ever had. Unless, of course, you feel the angsty need to garnish things as I do. In which case, sprinkle some parsley bits. Then, dive in, grab a coffee and enjoy. Pajamas recommended.